About Translation: Can translators ignore theory? Being informed about translation theory is knowing what others have said and thought about translation: its purposes, how to judge whether a translation is accurate, successful, or well written. How to translate to achieve specific goals, what responsibilities translators have, and whether they are primarily responsible to the author, the original text, the reader, or the customer who commissioned a specific translation. To be sure, without knowing or being aware of translation theory one can still translate. But translators who learned translation from teachers who reject theory out of hand and only emphasize learning by simply translating, are still following a translation theory of sorts. A theory, however, they are not aware of, and that they cannot, therefore, examine critically and tap for specific occasions or assignments. Downplaying the importance of theory, while teaching translation through a series of commandments, as Mark Freehill seemingly does (from what could be seen in his presentation at the recent 52nd ATA Conference), is contradictory: his students will learn a confusing mishmash where on the one hand they are told that there are many different ways to translate a text (true, of course, as far as that goes), but on the other hand are taught absolute “commandments of interpretation” and “deadly sins of translation”. Never, never, never give in the temptation to improve the original. If the original is vague or clumsy or just plain wrong, then a good translation will faithfully reflect the flaws. After all, that was how the original author wrote it. Stated in such stark terms, this is nonsense. Freehill referred, in his examples, to legal translations, saying that the reader of the translation has a right to know where the original went wrong. Fine (maybe) if the reader commissioned the translation precisely so as to find its weak points, perhaps to challenge them in court. But what if the customer is, instead, a foreign attorney who had his brief translated to file it in a US Court? Should a conscientious translator merrily translate the text “as is”, errors, warts and all, or should he point out to his customer unclear and wordy passages, suggesting suitable improvements? What about a translator commissioned to translated a hastily (and therefore badly) written press release. Shouldn’t he do his utmost to make the translated press release as smoothly flowing, well written and informative as possible in the target language? During Freehill’s presentation Chris Durban remarked that by teaching his students never to improve on the original, he was condemning them to the bottom of the market. I agree. By limiting the choices available to his students, Mr. Freehill is depriving them of vital tools necessary to succeed in translation. What a great article, Riccardo! I think that no matter what translation theory you subscribe to (even if it is, as you say, the theory of No Theory), it can only be beneficial to know what other points of view there are out there. As a translation school graduate I learned all sorts of theories, some of which I consider too academic to be practical for most settings but which were enlightening nonetheless. I would argue that Freehill's theory falls under this umbrella of being impractically academic. While it may be philosophically purer to translate a text as-is, the business reality is that improving the text usually adds value to your services and is one of the things that makes us more than "just typists." Yes, there are times when you want the warts, but being able to discern when warts are warranted is, again, one of the values we add. Love your blog posts -- keep 'em coming! Hi Andie, I don't know about "impractically academic" - after all, the title of his presentation was "Out, damned theory!". I would rather say "deliberately anti-intellectual". After reading this, I had to wonder if I've ever really been taught theory during my translation studies... I honestly can't say one way or the other. There have been plenty of rules, plenty of grammar dissections, but nothing really discussed as a theory. I'm sure there must have been theories behind the lessons, but it just wasn't that clear. My first efforts at translating would have been all the easier if there had been a theoretical lens through which to look at the content. There are so many subjective aspects to language that defining the possible variations--and their subtle differences-- is indispensable to a "wordsmith." Certainly to a wordsmith-in-training. Theories add to the level of professionalism in this trade, not because we have snooty theories to wave about, but because we show that we are thinking about our work on a meta-level. Maybe this is not so much about translation theory as such but about texts. If texts were only what is written down and if the purpose of a translation was to reflect this text into another language, i.e. to simply switch the code, maybe Mr Freehill is right. But if one thinks of texts being texts only as texts-in-situation, if one parted from a dynamic idea of texts, then the text to translate would be the whole picture that emerged in the translators mind when reading the letters of the text. And if the translator found flaws and corrected them in order to understand better the meaning of the text, this would have to be reflected in his/her translation. Another point would be, whether translators really translate texts, being the source text the guiding star of the translation or wheter translators commission texts as an information-offeron the basis of a source text, being the client's commision the guiding star. Again a fantastic post my dear friend. I wonder how much research you do with each topic related to translation. I really respect your vision of seeing the translators and your way of showing respect to their outlook of seeing the planet. After glancing on your every word it seems that I really had not taught almost anything during my translation classes about its theory. Although we have been told about the several rules but frankly we were not taught anything about those. After going through your post I don’t have any hesitation to say that I have become a fan of your writing and your knowledge. What we were not taught about this profession can be easily learned from your articles. Thank you brother! Will be waiting for your next post eagerly. Note that M. Freehill's "Never, never" statement ended up being about not "improving", say, evidence to be presented in court. Fair enough. But certainly no reason to claim that it is a universal truth. "Please insert your hands or any object into the washer while it is operating"
"Do not insert your hands or any object into the washer while it is operating"
I completely agree with you, this comment is absolutely interesting. Unfortunately, not many translators today have received a theoretical education as well as practical training, which is without a doubt necessary. In the London translation business, from the point of view of a freelance translator like me, most of the times clients do appreciate my effort in 'improving' the source text whenever I try to explain that there were mistakes. What is important is to be as clear as possible and provide the client with all the information for which we believe the source text needs revision. We also notice when we correct errors in the orignal text that our clients are extra satisfied. Which greatly increases the 'return' rate. Hello I have discovered your blog and I found this post very interesting. I would like to say that I completely agree with you. The client will always be thankful and will remember your concern and attention to detail. She makes the point that practitioners sometimes reject theory because they misunderstand what it is -- it's not a set a rules you have to follow ("and who are these academics in ivory towers, trying to boss us around, huh? huh?! "), rather an explanation of certain aspects of what we do. But of course theorists don't do themselves any favors by going out of their way (or so it often seems) to write so hermetically (Wagner points this out in her book, too). Since translators love comparing their freelance practice to that of traditionally "more prestigious" professions like doctoring and lawyering, they might do well to consider "Do you feel you would get the best treatment from a doctor who didn't see the connection between theory and practice?" (Fraser). And a personal comment: some practical translation teaching is done here in France by professional translators popping in to do an hour here or there at universities offering courses. Teaching can be very stimulating; why not. But when these translators are attracted by the pay (€35-40 per hour of classroom time; add in prep, transport and you're down to €20), there's a selection glitch, since a professional translator should be earning more than that in their day job. And when the content of what they are doing consists of simply running texts encountered past the students without attempting to give students an informed overview, everybody loses out. Ricardo, I read your blog about my ATA Conference presentation just last week and waited until I had time to respond properly. My two positions are: 1) You can translate and teach translation without theory; and 2) translators must avoid improving on the original. I did not and am not going to get into a theoretical discussion of the merit of theory. My first assertion was backed by eight worksheets I have created which have the intention of guiding students towards heightened sensitivity to nuances which, in turn, can lead to rules-of-thumb which simplify and unify the translator’s work. Instead of making theoretical pronouncements on comparative grammatical structures, I invite my students to translate a simple statement “I like Santo Domingo.” and in the course of doing the translation, they see the more general point and learn to apply it. Similarly, the intention in all but two of the other worksheets is to get my students to learn about translation by translating. My “Ten Commandments”, as I stated in my presentation in response to a question, are tongue-in-cheek but still to the point; at any rate I did not have time to discuss them in Boston and they have not been questioned on their merits, only the title has been scoffed at. I will leave to others the theoretical discussion as to whether or not they constitute any kind of theory. Translators strive to make their translation as much like the original as possible. Improvement is an avoidable modification. I learned a great word in Boston, when the folks from ATA and the University of Illinois were reeling off things translators can do other than translation. The word was “transcreation”, the example they gave is when you are called to deal with an advertising slogan. Years and years ago, and this is my example, Continental Airlines advertised “We really move our tails for you.” Easy as pie to translate literally, deucedly hard to get in the double entendre. What’s the translator to do? Do something other than translation and help the client come up with a slogan in the target language that will do the trick and sell Continental Airlines. I suppose that is why movie titles for dubbed/sub-titled movies often differ so greatly from the originals. The target language title has resulted from a process other than translation. The client may be happier, the commercial benefits to the client may be greater, the client may send more work the translator’s way, the world may be a better place. There’s nothing inherently bad in what the translator has done. It’s just something other than translation. When asked by my clients, I have been known to do things other than translation myself. I live in the world of legal documents. A law already on the books, a published court opinion, a signed and sent letter to a client, they are all written in stone. They must not be modified. Ergo, they must not be improved. In Spanish the possessive pronoun su can mean “his”, “her”, “your”, “its” or “their”, so the antecedent has to be sought in the context. Sometimes it is not clear. Suppose the text reads something along the line of “Ms. Jones is the legal representative of the Acme Corporation and su action can compromise su liability.” Poorly worded and ambiguous. Even though you may be 90% sure it is refers to Acme’s action and its liability, Ms. Jones would certainly be interested in knowing that there is an off-chance it might refer to hers. In fact, them devious lawyers who wrote the text may have inserted the ambiguity intentionally hoping to get Ms. Jones to take the rap. If you the translator “improve” by using English language that is crystal-clear, then you have done Ms. Jones a substantial disservice. That is why modifying with the intention of improving the original is a no-no. As wordsmiths (and I aspire to be one), we are offended by inelegance and carelessness. God forbid anyone should think that I don’t know the need for subject-verb agreement; but if the original document contains the language “the contract are…”, then what am I to do? I think by now it is clear that my answer is not that I should improve the original by correcting the error, somehow it must be reflected in the translation. Many an accurate rendition of ambiguities, poor sentence structure, grammatical inconsistencies and outright errors can be flagged with “sic”, which points out that this was just so in the original. Some cases might call for a footnote, which admittedly clutters up your document. In the paragraphs above, the practical examples, to my mind, make the points much more clearly than a theoretical discussion. Son of a gun, my worksheets might suggest that I am on to something and that my students might eke out some benefit from this approach. Calling a colleague’s methods and ideas a “mishmash” and “nonsense” (by the way I am neither “impractically academic” nor “deliberately anti-intellectual” but rather, like Goldilocks, “just right”; and the students who have gone on to successful careers after having taken my courses will be dismayed to learn that they were supposed to be “condemned to the bottom of the market”) is a bit south of what I regard as courteous scholarly dialogue. By the same token I respect your right to run your blog as you deem fit, I shall exercise my own by abstaining from darkening your e-door again. This will be my last word on this subject in this forum. But let the cause live on! I was very hostile to translation theories for many of the 22 years I've been translating now, and I believe firmly that much, maybe most, translation theory involves some sort of ex post, retrospective analysis at a level of abstraction that makes it so utterly remote from the translator as to be on another planet. Similarly, many translation academics – especially here in Europe – take great pains to put a large distance between themselves and those lost souls who pursue the grubby, profit-driven business of translating for a living. Recently, though, I've been examining two particular areas of translation theory that I now believe can provide working translators with ex ante, prospective guidance on how to go about translating a text, more specifically in financial and financial/legal translation (my own area of specialisation): first, Venuti's notions of domestication and foreignisation, which can really help us to distinguish between texts designed for financial communication, for example, and more formal financial/legal text genres. And second, skopos theory as developed by Christiane Nord, whose "Uebersetzungsauftrag" can be seen to converge with, for example, the objectives and principles of financial reporting as elaborated by the IASB. I've been including these aspects of translation theory in my seminars and university lectures for over a year now. I'm not sure that all the seminar participants and university students have grasped what this is all about yet, but I am beginning to receive some extremely positive feedback, especially from those of them with more significant translation experience. What's both ironic and disappointing, though, is that the suggestion that I should look at these two areas of translation theory came not from translation academics, but from finance academics! I think that, if finance professors believe that there are merits to some aspects of translation theory, there's probably going to be something worthwhile examining there. And they're right. As far as the "never improve on the original" debate is concerned, I find it very difficult that anybody could ever have said "never" here. Of course, there are situations where you can't "improve" on the original even if you want to, because the source text is already writ in stone, and the legal documents cited by Mark Freehill are good examples of this conundrum. However, that doesn't stop the translator pointing out errors, omissions and inconsistencies in translator's notes, especially where potential ambiguities are concerned. Of course, if what you're translating hasn't actually been finalised or published yet, the translator has a duty to point out and rectify problems in the text in any case. This certainly happens a lot in texts that I translate. For example, if I detect a misinterpretation of an accounting standard in a company's accounting policies, I'll correct the translation to what it should read and bring the matter to the client's attention as a matter of urgency. The same applies to other evident errors and omissions (very common when the source text has clearly been written and rewritten by a committee). If an author incorrectly cites something, or gets a proper noun wrong, the translator is duty-bound to point out the error by getting it right in the translation and adding a translator's note. So, to sum up: the translator can improve on some texts, but not on others. Nothing's black-and-white in translation. 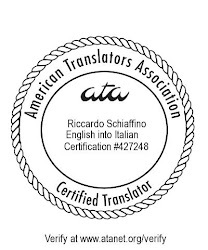 Riccardo, thank you for bringing up a topic that is dear to my heart, the source of so many misunderstandings in our community of translators and interpreters. I attended most of Mr. Freehill's presentation at the ATA Conference in Boston. I won't recreate my disagreement with him about the value of translation theory, but there are some points I would like to make. First of all, translation theories are relevant to the work translators perform. We don't have to like them all, but we need to educate ourselves in their merits, advantages and disadvantages to be better professionals and practitioners. Second, a translation educator who deliberately eschews all discussion of translation theories is undermining his/her own academic standing (ie, trying to reinvent the wheel, as it were). Third, opposing the teaching of translation theory without creating a space for discussion and analysis is intellectually dishonest. You may fiercely disagree with what Nida, Coseriu, Pym or Venuti have to say about translation, but you are doing a disservice to your students and to yourself by refusing to study them. Mr. Freehill teaches translation, especially translation of legal documents. He has a B.A. in a field unrelated to translation and he is a professional interpreter. Can an interpreter teach translation? Sure, as long as he or she has received the proper training. It is not just about translation theories, but other areas germane to the craft of translation that have to be taught, discussed and analyzed in the classroom. Fourth, Mr. Freehill forgets that, while a translator may not change the English original of a legal document (a contract, treaty, etc. ), the translation can well improve on the original. That's a tenet the majority of professional translators understand. If the English reads "The contract are hereto deemed a prerequisite to perform projects for the government..." the translator may well restore the subject/verb agreement. After all, most contracts have a clause about the value and legal standing of a translation. I am surprised that Mr. Freehill chooses to ignore this fact. I agree with Riccardo's statement that Mr. Freehill ends up teaching a 'theory of sorts' and he uses lists (sins, commandments). The problem with his approach is that it does not promote critical thinking. His students risk graduating with a knowledge of Freehill's theory, a pretty incomplete tool to compete in today's world. I have been reading the Chesterman/Wagner book Riccardo suggests for some years now. There is so much we can gain from learning and understanding theories of translation, but we need to approach it with an empirical mind. I could not agree with you more! I have proofread many translations into Spanish and whenever you find a flaw or something unnatural in the target 75% of the time it is not due to a bad translator but to a bad source text. I am not sure it happens so much in legal translation as much of it is written in a standardised way for each language, but it definitely happens... A lot! Vermeer's skopos theory proves very handy here. "To translate means to produce a target text in a target setting for a target purpose and target addressees in target circumstances." Having said that, the translator should know beforehand the aim of the translation s/he's about to produce. So if the client wishes to retain in the translation the errors in the source text, the translator might want to consider this; otherwise, I believe it's the translator duty to clear ambiguities in the source text. Hmm..... as a translation student, I do have a lot to say on this topic... if you ask students like me, ten out of ten of the students would consider translation theory as the most boring module to choose. However, personally, I do think that there are a few very brilliant theories and theorists. For example, Nida's dynamic equivalent is my favourite theory. Although this theory has been criticized since it came out, I still think it works so well in a lot of situations, especially between two very different language and culture, such as Chinese and English. Besides, I think Skopos is also very practical and it's best for translation companies to use.